A Russian cosmonaut, a NASA physician-astronaut and outgoing Canadian space station commander Chris Hadfield, whose deft use of social media turned him into an orbital superstar, undocked and plunged back to Earth Monday to close out a five-month stay in space. Two days after an impromptu spacewalk to fix a coolant leak -- and one day after a YouTube video of Hadfield singing David Bowie's "Space Oddity" went viral with more than 1.5 million views -- Hadfield, Thomas Marshburn and Roman Romanenko undocked from the station at 7:08 p.m. EDT (GMT-4). After moving a safe distance away from the sprawling lab complex, Romanenko monitored an automated four-minute 45-second rocket firing starting at 9:37 p.m., slowing the ship by 286 mph and putting it on course for a landing near Karaganda, Kazakhstan. A half hour later, the three modules making up the Soyuz TMA-07M spacecraft separated and the crew's descent module, the only part of the ship equipped with a protective heat shield, fell into the discernible atmosphere at an altitude of about 62 miles. Nine minutes after that, at an altitude of about 6.7 miles, a large braking parachute unfurled and long-range television cameras followed the craft as it descended to a jarring rocket-assisted touchdown at 10:31 p.m. (8:31 a.m. Tuesday local time). The weather was ideal and Russian recovery crews stationed nearby quickly rushed in to "safe" the descent module and help the returning station fliers out of the cramped cabin as they began their readjustment to gravity after 146 days in weightlessness. Live television views from the Kazakh steppe showed the charred module resting on its side, surrounded by recovery personnel. As usual, recliners were set up near the spacecraft where the Soyuz crew members rested after they were pulled from the capsule. 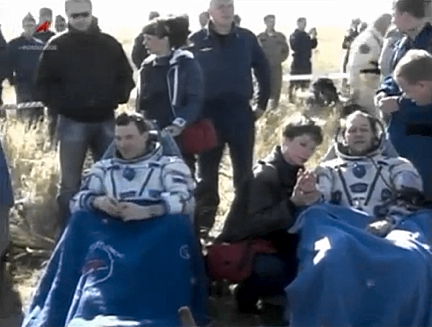 All three looked healthy and in good spirits, smiling and chatting easily as they relaxed in their pressure suits. "That was quite a ride home," Hadfield told someone on a phone. After brief medical checks, Romanenko, Hadfield and Marshburn were expected to be flown to Karaganda where they will split up. Romanenko will board a Russian plane for a flight back to Star City near Moscow while Hadfield and Marshburn head back to Houston aboard a NASA jet. Going into the mission, Hadfield, a shuttle veteran and Canada's first spacecraft commander, said he had three primary goals: to keep his crew healthy, to keep the space station in good shape and to accomplish a full slate of scientific research. "I can very proudly say that all three have been accomplished in spades," he said Sunday. "The crew is healthy and happy and I think any of us would come back given the opportunity. "The spaceship is in good shape and on the science side ... we set a record for utilization, the amount of research done in our tenure on board." During a brief change-of-command ceremony, Hadfield formally turned the station over to Expedition 36 commander Pavel Vinogradov, Alexander Misurkin and NASA astronaut Christopher Cassidy. They will have the station to themselves until three fresh crew members arrive at the end of the month. Hadfield said he was particularly pleased with the outcome of a spacewalk Saturday by Marshburn and Cassidy to fix a potentially troublesome ammonia coolant leak. The spacewalk was executed just two days after the leak was observed on the station's solar power truss. 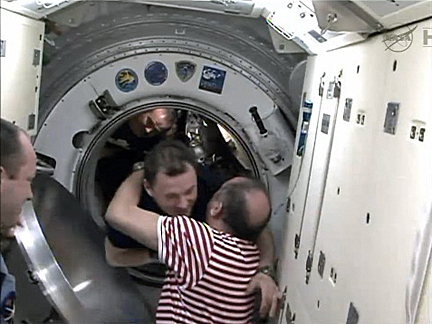 "The realtime execution of that was what just felt so good to me as commander of this crew," Hadfield said. "So for me, my initial objectives, my dreams for how this might go and the realization of what this crew can do together ... for me, this was just the personification of what the International Space Station is and what the people mean to it. "This is a human research vessel. We've shared it with millions of people around the world, and we've done our absolute best to accomplish the work on board." The trio was launched from the Baikonur Cosmodrome in Kazakhstan on Dec. 19, docking two days later. From the very beginning of their stay aboard the station, Hadfield utilized the lab's satellite internet connection to file a steady stream of Tweets, photos and movies. By the time his mission entered its final stages, he could boast more than 830,000 followers on Twitter with more than 1.5 million views of his most recent video, an updated version of "Space Oddity," shot throughout the space station and mixed with other instruments during editing on Earth. "With any new technology, it takes a while for people to get used to it and start using it," he told a Canadian interviewer shortly after reaching the station. "Look at telephones a little over a hundred years ago, or airbags in cars. "Even though the technology exists, more and more people become aware of how useful it can be. 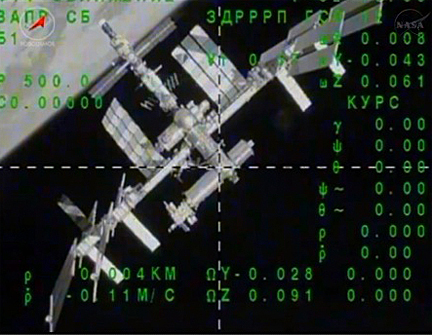 And what we're doing on space station is fundamentally fascinating. I think the evidence shows through a measure like Twitter. ... With these new technologies and communications, we can directly give people the human side of that." Judging by responses to his postings, he succeeded. "You have consistently done more for my awareness of the space station than anyone ever has," one YouTube viewer commented. "Your approach makes it﻿ feel like we all have family in space. Thank you!!" Said another: "Incredible....Space was already awesome, and you've made it even more so :D Thank you for that." Jeremy Hansen, a Canadian astronaut in mission control at the Johnson Space Center in Houston, closed out the change-of-command ceremony Sunday by thanking Hadfield for his service "on behalf of Canada." "We are extremely proud of you and your efforts, you have fueled a new appreciation for what the challenges of space exploration have to offer our planet," Hansen said. "Your leadership has been an example to all of us, and your extraordinary efforts to share space with us has inspired us to look back upon our planet, spaceship Earth, with a new perspective and respect. "Canada is most certainly indebted to you for your tireless efforts. 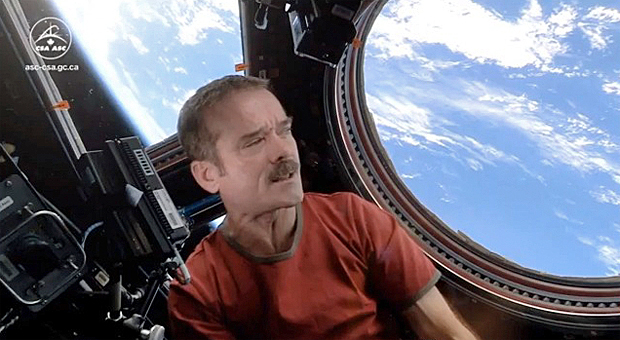 To you and your crew, commander Hadfield, we thank you."